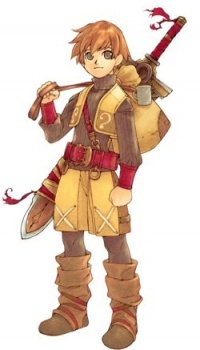 A lively young man born and raised in Solieu Village, a town a little ways from Radiata. He lived a peaceful life with his older sister Adele until his 16th birthday, when he decided to test his mettle by trying out for the Radiata Knights like his father before him. He was accepted into the knights, not for his ability, but his heritage, and he became part of the Rose Cochon Brigade. After he is fired from the knights, he joins the Theater Vancoor and quickly rises to the rank of Sergeant and is chosen to be Deputy Chief Gerald's successor. Although he is stunningly oblivious to Ridley's affection at first, he soon begins to have feelings of his own. In both paths, he kills Aphelion. He leaves Radiata in the Human Path, while in the Fairy Path, he and Ridley return to Radiata together.